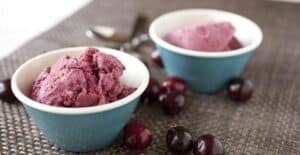 By roasting the cherries for this homemade sherbet, their flavor is intensified. This frozen treat is the perfect way to beat the heat! 1) Preheat oven to 425 degrees F. Wash cherries, halve them, and remove the pits. Lay out cherry halves on a baking sheet and bake for 15-20 minutes until they are slightly withered and the juices are bubbling. 2) Let cherries cool briefly and then add to a blender with other ingredients. Blend until mostly smooth. 3) Transfer to the fridge to chill completely or add the mixture to a bowl in a large bowl with ice/salt/water to chill quickly. 4) Churn the mixture in your ice cream maker according to instructions. When it reaches a soft serve consistency, transfer to a freezer safe container and freeze until solid, stirring once or twice as it freezes. I think it’s best to let this thaw for five minutes so it softens a bit before serving. Recipe very roughly adapted from Bon Appetit July 2013. This delicious recipe was brought to you by Macheesmo. Read the full post at https://wp.me/pkSYO-9Cl.